From the first track “The great leveller” you really know that you are listening to something special. 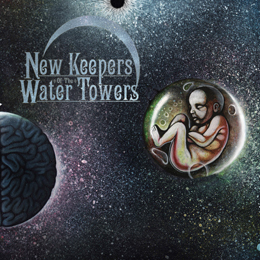 New Keepers Of the Water Towers’ third album is a brilliant combination of math, psychedelic-, prog, doom and stoner rock. Slower tunes like the unforgettable “Visions of death” have a trance-like quality providing this disc with subtle diversity bathing in saucy layers of guitar and a strong sense of melody. It is impossible to classify the twelve minute epics.“Pyre for the red sage” and “Lapse” with infectious guitarleads, steady rhythms, dark atmosphere and dreamy vocals. This cd is an adventurous and interesting journey, the Swedish equivalent of Mastodon’s Crack the Skye, on which this Swedish quartet take us. The songs are challenging and the overall presentation is worthy of serious consideration by music fans everywhere. Superb stuff and highly addictive once tried!